Eugene Bernard Holiday was born on St. Maarten on December 14, 1962 as the fourth of seven children from the marriage of Eugene Bernard Holiday Sr. and Leone Cassandra Marsham. A devout member of the Methodist Church in St. Maarten, he was raised in a strict Methodist family where attending church, Sunday school and Boys Brigade were mandatory. Spiritual development school was a priority in the Holiday family. Holiday attended primary school at the Oranje School and the St. Joseph School in Philipsburg and completed part of his secondary school at the Milton Peters College, in South Reward, St. Maarten in 1979. In July 1979, at the age of sixteen, he left St. Maarten for the Netherlands to further his education. There he completed his secondary education at the Roman Catholic School Canisius College-Mater Dei, in Nijmegen in 1982. He then enrolled in the economics program of the Catholic University of Brabant, in Tilburg and graduated with a doctoral (drs) degree in economics in 1987. During his studies in the Netherlands he looked forward to and returned home on vacation annually. While on vacation in the summer of 1985 he met Marie-Louise Hazel. That same summer she went to the Netherlands to continue her studies in accounting in Breda, at the College of West-Brabant. They started dating later that year and after her graduation married in St. Maarten in November of 1990. Holiday is an avid sports fan having played baseball, basketball, volleyball and pool competitively as a child and young adult. Like in academics, Holiday excelled in sports, led his teams and represented St. Maarten on national teams in regional baseball and pool tournaments. The caring, fun filled, disciplined, decent and positive upbringing with emphasis on mutual and self-respect provided by his hard-working and honest parents shaped Holiday’s life and character. Grounded in his family heritage and values he has a calm and positive attitude towards life, is interested in a broad range of issues and is committed to contributing to the promotion of the well being of the people of his community. Holiday, a hard-working, thorough and calm person, has an extensive career in business and public service spanning almost two and a half decades. • Following his graduation he moved from the Netherlands to Curacao and began his career as an analyst and policy advisor at the Central Bank of the Netherlands Antilles in September of 1987. Within a year and a half he was, at age 26, promoted to head the Research and Monetary Policy Department of Bank. His last function at the Bank was Deputy Director charged with monetary and economic affairs. • In May 1995, the 32 year old Holiday returned home to St. Maarten to take up the position of Managing Director of Windward Island Airways International Ltd where he steered the affairs of the national airline for almost 3 years through some of the airline’s most difficult years due to the impact of successive hurricanes on the company’s business. • In February 1998, at the age of 35 he was appointed, President Director of the Princess Juliana International Airport Operating Company. 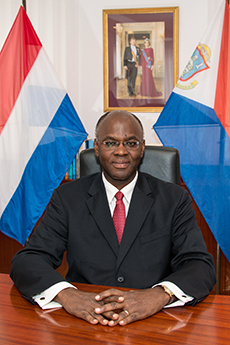 During his 12 plus years at the airport he was responsible for the overall management and development of the airport and air traffic control business on Sint Maarten where he reorganized the company into a service oriented business and led a complete transformation of the aviation infrastructure and landscape of the island. • Over the years he has held various secondary functions in committees, workgroups, managing and supervisory boards, covering a variety of areas, ranging from economic development, educational development, banking, finance and constitutional reform. Three examples of such work include the following. In 1994, while still working with the Central Bank and living in Curacao, he was, after the Electricity and Water Company of the Windward Islands (GEBE) had just gone through an enormous upheaval and was left without a Managing Director, requested to chair the Supervisory Board of the company and travelled every Friday to St. Maarten to help oversee the restoration of order at and reliable utility services by the company. Shortly after his return home he was, following the devastating hurricane of 1995, called on and led the taskforce that developed and drafted the economic recovery plan for St. Maarten. Appointed as adviser and negotiator representing St. Maarten during the constitutional reform process from 2000-2010, he played a key part in helping St. Maarten achieve the Status of Country within the Kingdom of the Netherlands. • Appointed by royal decree and having taken the oath before H.M Queen Beatrix he took office as the first Governor of St. Maarten on October 10, 2010 at the age of 47. In his capacity as Governor, Holiday represents H.M. King Willem Alexander on St. Maarten and functions as Head of State of the St. Maarten. As Governor he also represents the Kingdom Government on St. Maarten. A big sports fan Holiday currently enjoys NBA Basketball, playing tennis, golf, pool and scrabble in his free time. He also enjoys writing and has documented his thoughts through poetry, several research papers and articles. Disclaimer: The information contained in this website is provided for general information and is only intended as such. The information provided is not legally binding. The Office of the Governor of St. Maarten is not liable for any damage that may occur due to ambiguity or incompleteness of the data contained in this website.